Has Boston unlocked Ubuntu 2.0, or is this just a tease? 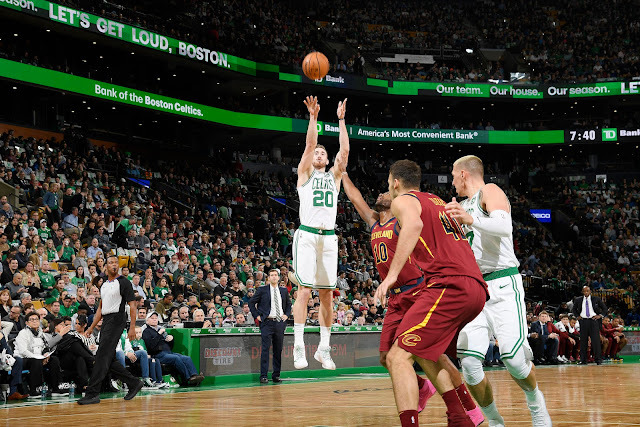 It might have taken longer than we would have liked for the Boston Celtics to adjust their attitude as much as their play, but we're starting to see results, and in the long run, that's what matters. Plagued by the very "next man up" approach that was a godsend when the team was critically undermanned last season, too many cooks were spoiling the offense early this season, to murder a turn of phrase. And when the lack of team play and consistent effort teamed up with a rough stretch of shooting for many of Boston's starters, well, we know how that went - poorly. Now, with injuries and desperation having forced lineup changes that, for whatever reason, coach Brad Stevens was loathe to attempt until very recently, the Celtics found themselves facing the possibility of having disgruntled players as a result of those shakeups, an issue which can open an entirely new - and potentially disastrous - can of worms. Except, at least so far, it hasn't. This is how the Celtics opened 2nd quarter last night: backdoor lob for Hayward. 1) Great to see Gordon having that confidence to run that play again. 2) He almost caught that! With the Marci (Marcus Morris and Smart) injecting some much needed urgency and efficiency (I still can't believe I just typed that about those two, but here we are) into the starting lineup, it's probably a reasonable wager to assume we'll be seeing at least one of the two taking Gordon Hayward and Jaylen Brown's slots in the first unit, at least until they both get fully right after rehabbing two very different kinds of injuries. We all know about Gordon's fall and gruesome injury, and how, with models like Paul George suggesting both physical and psychological aspects may take weeks if not months more to return to something like the Hayward of yore. We also know how Brown's recent tailbone bruise after a nasty fall against the Dallas Mavericks, and ongoing struggles with inflammation in his feet, are likely to keep him from playing at his full capabilities for at least a little while longer (Jaylen may be able to return as soon as tonight's game against the Minnesota Timberwolves; whether he ought to is another story). Jaylen should take his time returning if he has any doubt about his health, and both should expect at least a temporarily diminished role until they are ready to start based on performance, and not past achievements. Enter fears of disgruntlement - but for now, dismiss them just as fast; at least as long as their absence or removal to the second unit goes. As long as they win, they are happy, they say. After all, it's what they are supposed to say. "Possibly ... especially if we are winning. Whatever it is that needs to be done to figure it out ... Everybody has talent, everybody has ability, but, obviously, we have to make something work here. We don't want to be looking down the line and trying to figure out, 'What if?' or 'Woulda, coulda,' whatever. ... Whatever it is that we can make it work now, I'm totally happy with that. Winning answers everyone's questions and figures everything out. If we win, everything else will be fine." "It’s very important for a young guy to step up like that ... I think when [Jaylen] comes back, he’s going to fit in whatever role Coach gives him. We’re just trying to keep it going. We’ve got good spirits right now and we’re just trying to let this thing go as far as it can." Winning cures (almost) everything, so let's hope Boston's unlocked something with these lineup adjustments and attitude shifts. So far, I like how it's translated into effective, and at times, dominant offense and consistent defense, but there's sixty (yes, really!) more games to be played, so...fingers crossed.